George Radbourne was born 8th July 1842 in South Leigh Oxfordshire. 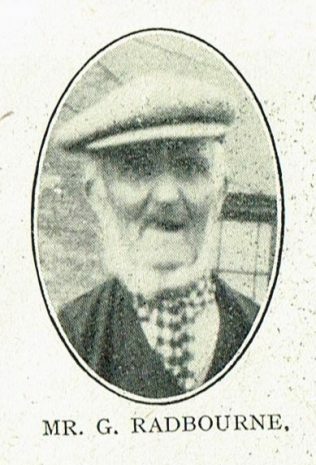 With his wife, Emma, (whom he had married on 9 shillings (45p) a week) and their 2 children he moved to Wishaw not far from Sutton Coldfield in 1867 to work as an agricultural labourer. 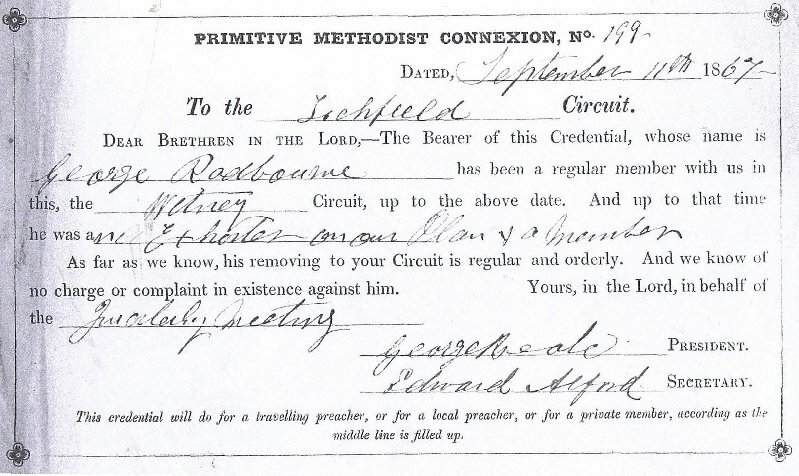 Nothing is known about how he came to be a Primitive Methodist but we do know that when he left South Leigh he was an exhorter on the plan as is evidenced by the credentials presented to the Lichfield Quarterly Meeting following his move. Finding no Primitive Methodist chapel in the immediate area he made his way to Glascote then a village about a mile from Tamworth town centre. From Wishaw, this was a round trip of some 16 miles (which he undoubtedly walked) and he became a member of the Primitive Methodist chapel there where he was appointed class leader in September 1869. In the mid 1870s upon the opening of the colliery in Alvecote he moved to there to work as a miner and, by middle life, he had become a deputy. He joined the Alvecote society following its formation in 1889 and served in several capacities. At the 1927 September Quarterly Meeting he received the following accolade. That we heartily congratulate Mr Geo Radbourne of Alvecote on the completion of 62 years of efficient and faithful service as Local Preacher. Our brother was born on July 8th 1842 and was placed on the plan by the Dec QM of 1865. His work as a Preacher has been treated seriously and although he has had to travel long distances on foot he has never been charged with neglecting his appointments. Mr Radbourne took an active part in establishing the Churches at Glascote and Amington. He is a trustee of both Churches and also Warton. For many years he has served as Class Leader, Society Steward and Treasurer of the Trust and Sunday School at Alvecote. For shorter periods he was SS Superintendent and Circuit Steward. Our brother is highly respected throughout the District, We are glad he is well and able to take an active interest in the business; we wish him continued health and strength. In George Radbourne, we clearly had a man of conviction and earnestness prepared to travel long distances on foot to fulfil his calling to preach the Word and who served as a local preacher for almost the whole of the life of the Tamworth Primitive Methodist Circuit. 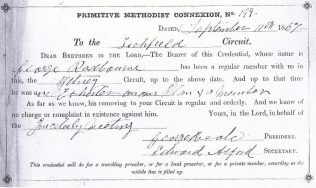 Not only that but he had the rare perhaps unique distinction of heading the list of local preachers on a Primitive Methodist Circuit plan for almost 60 years from the first plan in September 1869 until his death on 24th March 1929 aged 86! He delighted to preach the gospel, and did so with rare intelligence, deep conviction and much success. He was outspoken but charitable and eager to extend the Kingdom. He loved the house of God and gave it his best.